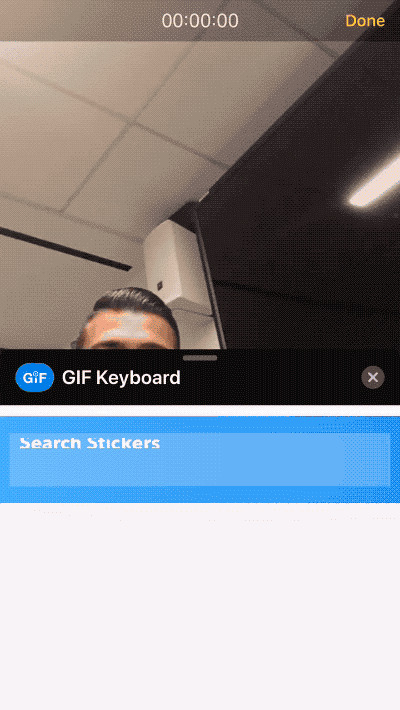 Tenor, the GIF platform acquired by Google earlier this year, has launched an integration with the iOS 12 camera platform that allows you to search for and add stickers to photos and videos within the Messages app. It’s a lot like an Instagram story or AR stickers from Giphy. The updated function allows for users to search stickers by keyword or within already-created “expression categories” like “kiss,” “mindblown,” or “hello.” Once found, stickers can be dragged to the live camera view. Add as many stickers onto the live camera view as you’d like to decorate it before sending. To add stickers to your photos and videos with Tenor, download Tenor’s GIF Keyboard app on iOS, open the iOS Messages app, and then the camera. From there, tap the “star” button in the bottom left corner and then select the GIF Keyboard icon. This should allow you to bring up the search with expression categories. There are already a handful of options for making GIFs and adding decorations to your photos, but maybe this will be quick and useful for when you’ve exhausted your Animoji or Memoji creations.